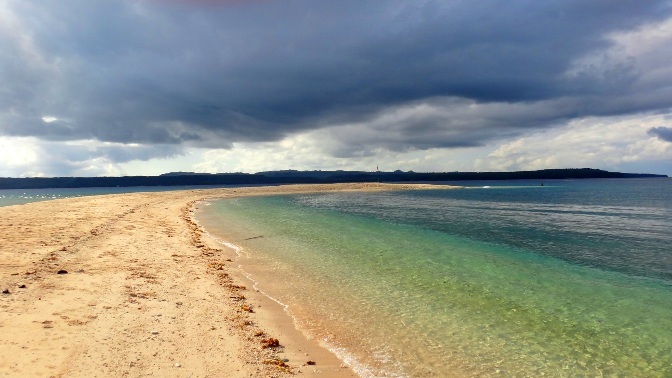 Note: This is Part 1 of 2 entries about Higatangan Island. Read Part 2 here. 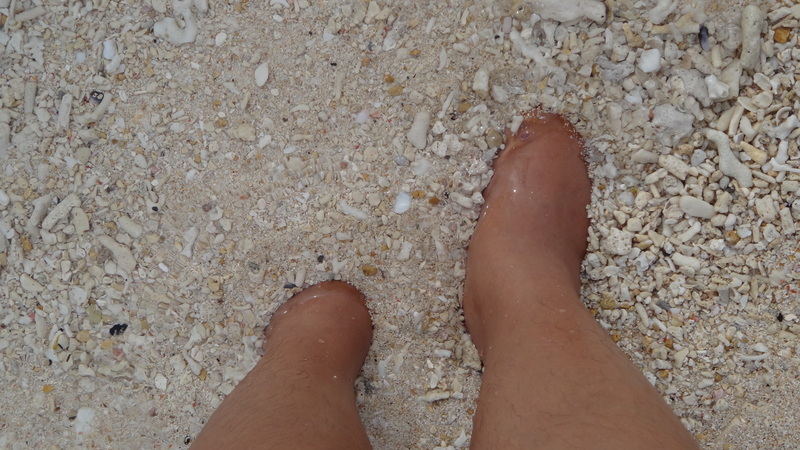 Here at Higatangan Island in Biliran, the sands are never the same. Its sandbar could snake into several meters one day and spread out in a few directions the next. The differences are most pronounced between the summer and rainy months. The gentle amihan (northeast monsoon wind) usually from November to May directs Higatangan sandbar to the right, while the stronger habagat (southwest monsoon wind) for the rest of the year blows it to the left. Sometimes, pools of water with fish can even be found in the sandbar during the habagat months, as a few locals have told me. And of course, the colors change, too, depending on the time of the day. 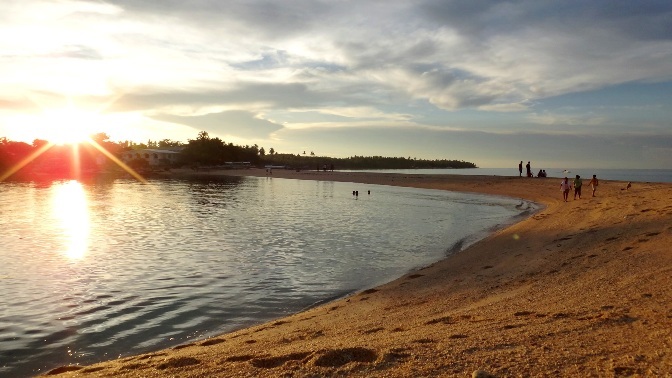 I had the privilege of walking along Higatangan sandbar at mid-afternoon, late afternoon to sunset, and sunrise and morning the next day. I was also lucky to spot sea gulls gliding at the end of the sandbar during the afternoon, though not lucky enough to photograph them. At sunset. Notice that another part of the sandbar is visible. The only letdown in my experience was that the sandbar had some trash like plastic and broken glass in it. I relayed my concern to the manager of the resort I was staying at and she said that the sandbar is cleaned, though not very regularly. I also told her and a few other locals I talked to that I – and other visitors, I believe – wouldn’t mind paying a small entrance fee if it would go to the maintenance of the sandbar. 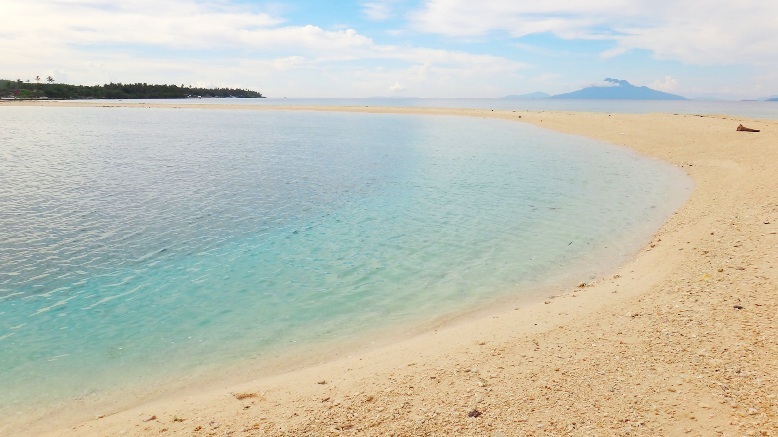 I could not help comparing the two times I had been to the White Island sandbar in Camiguin, which charged an entrance fee but was well-kept. 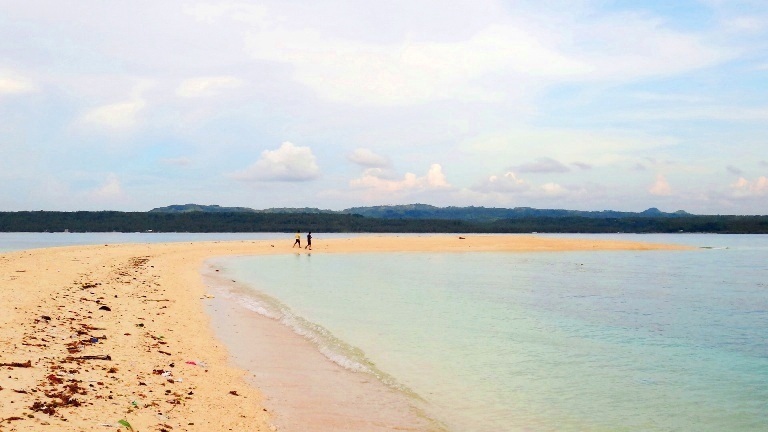 Hopefully Higatangan sandbar would look more pristine next time. 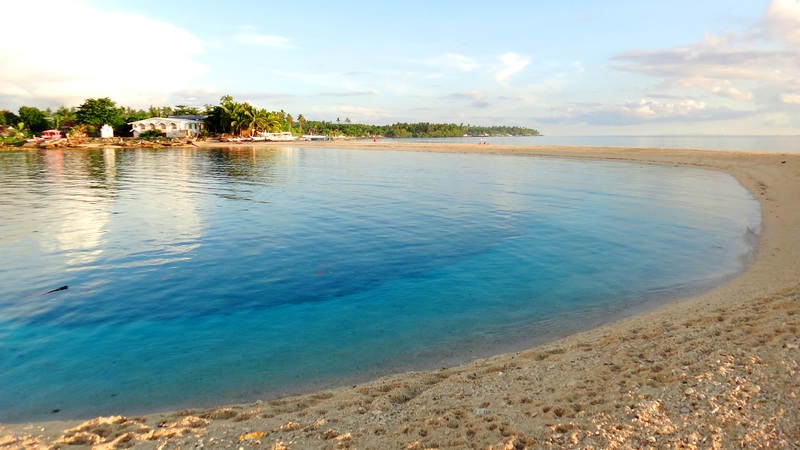 I would definitely go back, though, to see the sandbar’s shape in the habagat months. Some trash line the sand bar. I did not go for a swim – I was happy enough to walk along and sit on the sandbar. I’m a huge fan of sandbars, and I was particularly thrilled when I had the sandbar all to myself during the mid-afternoon. I saw that the waters quickly ran deep on one side. The sand near the deep end felt a bit like quicksand as my feet quickly sank as I walked. Locals have warned me that the shifting sands of Higatangan brings shifting depths. I would not discourage confident swimmers from enjoying the waters, though. In fact, I saw a few travelers happily dive into the deeper waters before sunset. The water looks inviting, though it quickly deepens a few steps from the shore. 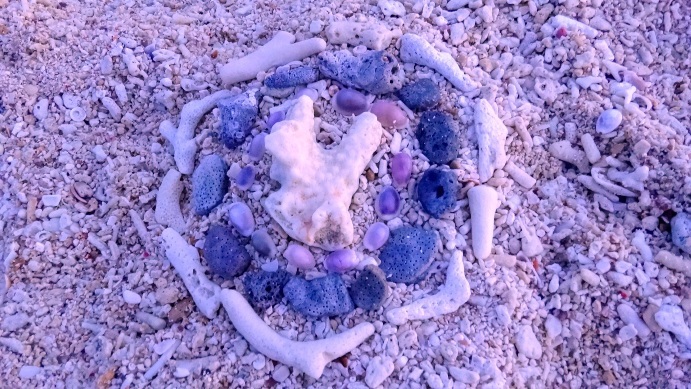 I watched them as well as the locals animatedly chatting and picnicking on the island as I made a quick mandala of thanksgiving. 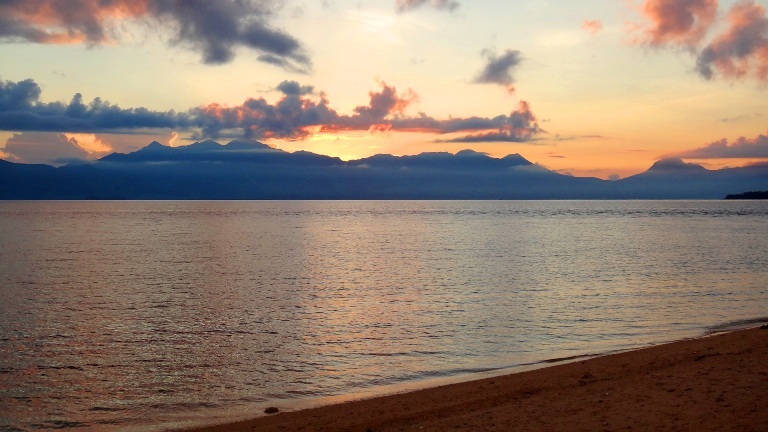 Before I planned my 7-week journey, I had never heard of Biliran or Higatangan. When I later mentioned to some of my friends that I was going to Biliran, they said they have never heard of it either. And now, at that moment, as I watched the sun set and the sandbar’s colors darken, I just felt immensely grateful, immensely blessed to be there. Take the van to Naval from Tacloban central terminal in Leyte. If you are coming from Ormoc, Leyte there is also transportation going to Naval from there. Just ask the locals. Take the boat which leaves at 11:30 am or 12 nn at Naval port in Biliran province. Fare is Php 50. Be there by 11 am or earlier to secure a seat. You can also rent a pumpboat to take you to the island. The boat trip from the island back to Naval leaves at 7:30 or 8 am the next day, so the best option is to stay overnight at the island to make the most of the experience. 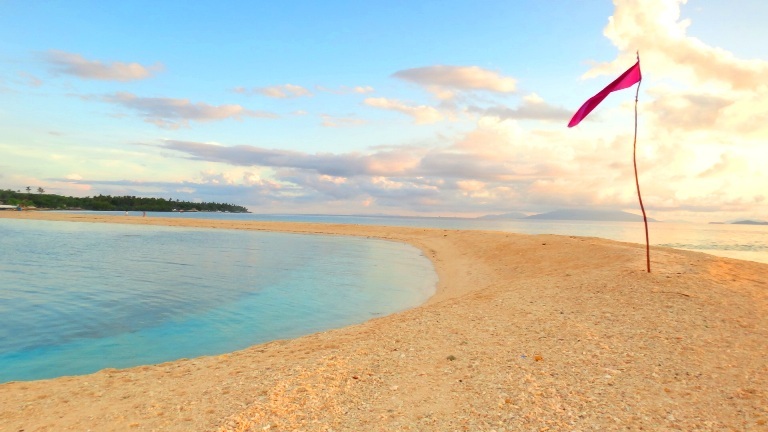 You can stay at Higatangan Island Resort, which is 5 minutes away from the sandbar. Their room rates start at Php 600, though you can pitch a tent there to save on expenses. There is also the soon-to-open Emponet Barton Beach Resort, which is a little farther walk to the sandbar but has a nice shoreline. Contact its owner Emily Poyos Pragas at +639213413377 and at e-mail addresses emyemponet@yahoo.com and ipoyosa@yahoo.co.uk.